Calling All Kids! Enter Our T-Shirt Design Contest! 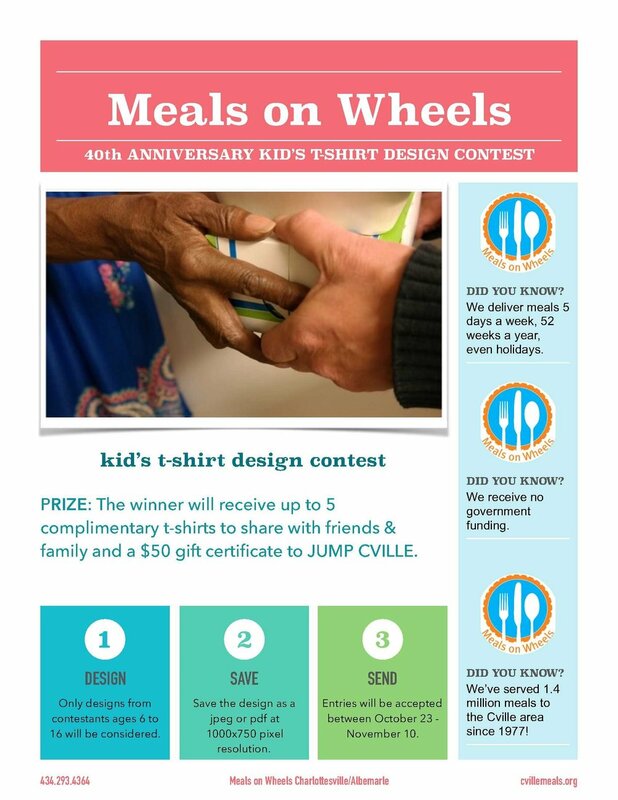 Help us celebrate our 40th anniversary by designing a t-shirt to recognize the important service Meals on Wheels provides to our community! We've delivered over 1.4 million meals to some of our neediest neighbors in the Charlottesville/Albemarle area since 1977. We couldn't do it without the dedication of our volunteers and the support of our community. Create a cool design to show people the importance of a hot, nutritious meal and a friendly visit and the impact it has on the lives of the ill, elderly and homebound. Meals on Wheels is... neighbors helping neighbors! If your design is chosen, you could win a $50 gift card to JUMP CVILLE and up to five complimentary t-shirts to share with your family and friends! The winner will be announced on Friday, November 17, at Meals on Wheels Charity Night at Kendra Scott at the Shops at Stonefield. Click here for more information and to see the full contest rules!